Seattle noise fans know when you see "Debacle Records presents" at the top of a show poster, you are in for something. 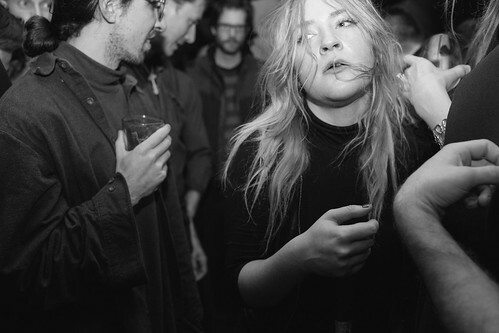 New York's Pharmakon may be on the fantastic Sacred Bones Records, but I think she'd be welcomed with open arms into a lasting relationship with Debacle Records, who supplied the rest of the entertainment for the Kremwerk event here tonight. It's shows like these where all the elements really come together into something magnificent. 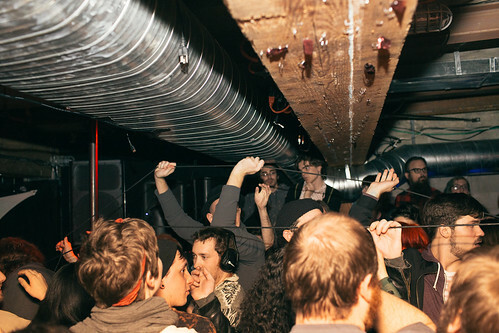 With Kremwerk's glowing milk and crowded spaces and thick haze, setup times DJed by KEXP's own DJ Sharlese, and a shared stage of Pharmakon and Debacle favorites Garek Jon Druss and Pink Void, tonight was truly an epic noise event for Seattle. Pharmakon made her first Seattle stop in support of new album, Bestial Burden, a wonderful and terrifying one.There were a number of excellent Debacle acts leading up to Pharmakon's headlining exposé, all with a wonderfully unique take on noise and ambient, each paying compliment to Pharmakon in different ways. 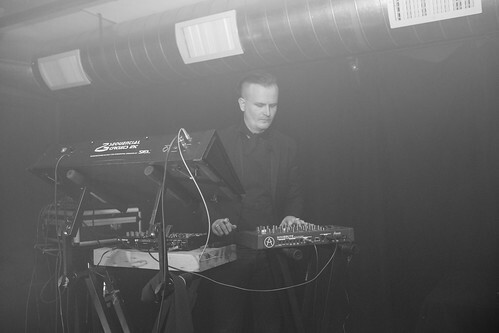 The night opened with a searing one-off display from Knifecream, who combined industrial noise and techno-apocalypse vibes to make a seriously hypnotic number of a track. 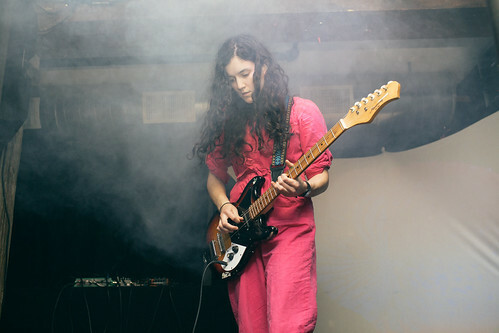 Continuing forward, Pink Void (Crystal Perez) went in an entirely different direction, manufacturing all of her noise with guitar. 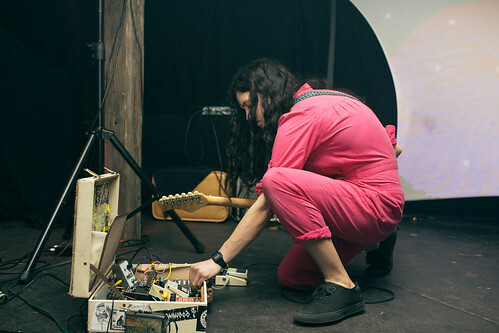 On the floor in front of her lay a suitcase full of tangled pedals, each with their own flavor of dissonance, which Perez would occasionally tinker with to create an evolving sonic wave that never let up scope or forward motion. Finally, Garek Jon Druss was the quiet before the storm. His forty minute ambient set was at times so calming and ethereal that you almost wanted to just lie down and take it in. It's no wonder why the man has an entire subsection of his website dedicated to commission work - he's a sonic engineering genius. The quiet and the loud, the soothing and the scorching, Debacle's support of tonight's show was in full display. 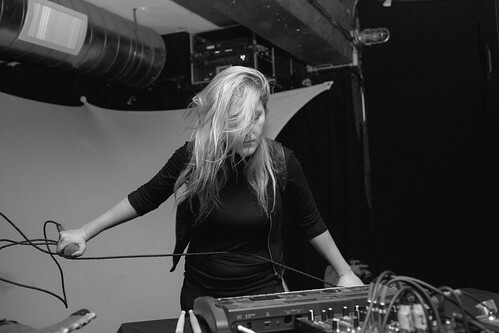 And with intermittent sets from DJ Sharlese heavy on dark wave and techno, there was plenty to enjoy before Pharmakon took to the stage bent on destruction. As Margaret set up her gear, I took in the setup. Her main table holds the keyboard you'll see in every shot of hers where she isn't down in the crowd screaming into the faces of the unbeknownst. There are a handful of effects pedals and whatnot channeled into it to give it a murky distortion that you don't want anywhere near you on a sunny day. It's a table dedicated to Chardiet's central sonic elements that can't be created with her hands or voice alone. The other table, however, is a bit more of a puzzle. All that sits there is a completely shapeless surface with a small clipped on microphone towards the bottom. In the dark it looks like a semi-rigid cloth coated in duct tape. 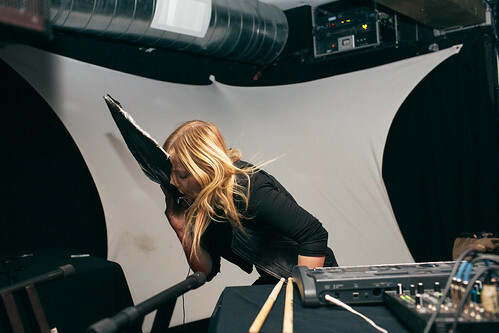 Thinking back a couple years, I remembered that Pharmakon had a piece of sheet metal mic'd up when she played Decibel Festival 2013 back in the day - maybe for the sounds of the new record this was its replacement. The surface was connected to distortion and reverb pedals as well as a looping pedal. This table, this setup - this is where Chardiet exorcises her demons. This is where she puts the literal meaning into Pharmakon. Chardiet's opening offering is "Autoimmune", the percussion-heavy third quarter cut from new Pharmakon record Bestial Burden that leaves very little breathing room. 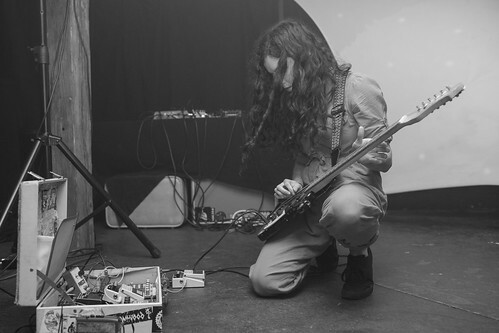 Chardiet cooks up a sonic onslaught on stage between her groggy bass synths and infinite loops of pound drum and banshee scream. Where Pharmakon's first Sacred Bones release Abandon tends to focus on embracing the taboo of death and abandoning the naivety of life without duality, Bestial Burden applies these concepts to flesh and blood. After almost dying due to a cyst and near organ failure, Chardiet had some firsthand experience with mortality. Thus, her new record is, beginning to end, an attack on the body. There is choking, there is panicked breath, and there is a conscious separation of soul and body. Bestial Burden is an impossibly heavy record, but Chardiet's unique exploration of these topics makes it a visceral listen. 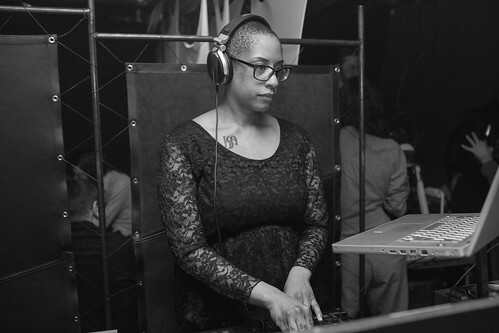 But there's no question that fans have been itching to see how Chardiet would bring the tracks to the stage and incorporated them into her hypnotic live shows. "Autoimmune" was just a taste test - a noisy and invasive cocktail before the main course. With "Intent or Instinct", Margaret set up her sonic foundation then grabbed the microphone and headed out to do some face to face campaigning. Maybe the most blood-curdling track of the whole record, "Intent or Instinct" sees Margaret staring down into your soul on every line over a mountain of industrial noise. 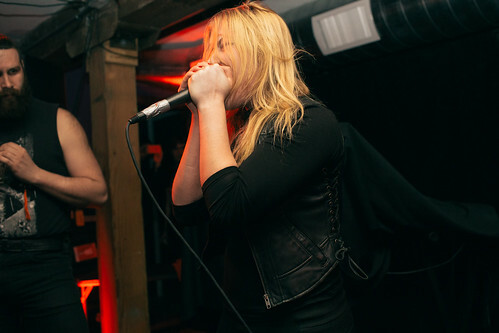 But the final social barrier wasn't broken until the new record's title track "Bestial Burden", wherein Margaret jumped down into the crowd with her microphone and went on a trip. The song works up to a climax of Margaret screaming "I don't belong here" and writhing around the feet of the audience without warning or apology. In the cramped, crowded space of Kremwerk, she makes a U-shape from one side of the stage back through the audience and to the other, then pulling her microphone cord back out of the crowd while cackling into the microphone like a crazy person. Here, the burden of her record becomes ours, as the crowd struggles to avoid strangulation by raising the cord up and over the hundred or so people she encircled. As Margaret made her way back to the stage and closed up "Bestial Burden", I had a sickening feeling run through my stomach. I realized that the drum surface was that piece of sheet metal from 2013. But between then and now and the countless Pharmakon onslaughts therein, it has just been beaten into a completely unrecognizable object. Hell, Margaret has probably gone through a dozen of these things in 2 years given the damage she inflicted on it only just tonight. 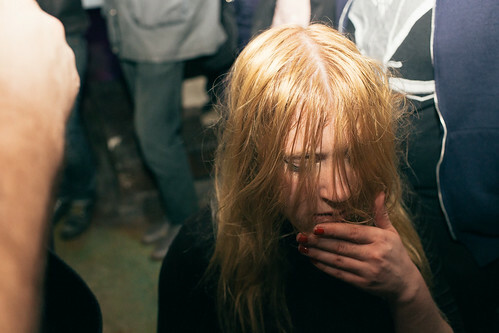 It just goes to show, Pharmakon is an experience not meant to be had by the faint of heart. But Margaret Chardiet continues to show us the visceral reality of confronting the void - she goes there so we don't have to. What she takes back, she shares with her audience to some extent on her records, but without any resignation in person. 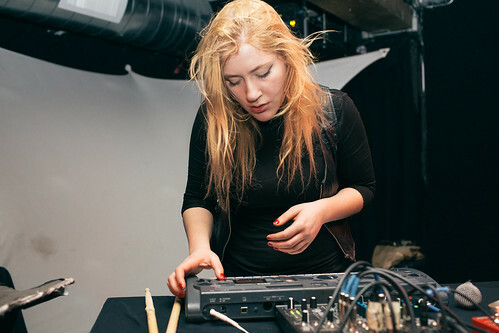 The darkness is indeed a bestial burden, but Pharmakon carries it with a brutal zeal.